Off with his head? A new version of Lewis Carroll's classic tale Alice's Adventures in Wonderland by first-time author Frank Beddor has already got several critics up in arms even before it has been published. 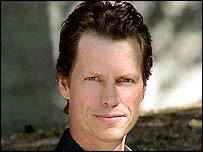 Mr Beddor, who produced gross-out movie There's Something About Mary, and is a former world champion skier, has transplanted Alice into a modern and violent fantasy world that could have come straight out of a computer game. The Looking Glass Wars, the first of a trilogy, tells the story of young princess Alyss Heart, the exiled future Queen of Wonderland, who embarks on the ultimate quest to reclaim her royal status. Alyss's new adventures take her through various dangerous territories before she embarks on her ultimate mission through the looking-glass maze. It is a far cry from the original tale, and Mr Beddor also defies the accepted wisdom regarding the origin of Carroll's famous book. Most academics concur they were written to entertain a young girl called Alice Liddell, whom Carroll befriended. Mr Beddor claims Alice Liddell told Carroll her story, not the other way round, and that the author betrayed her by changing the story into his own well-known version. 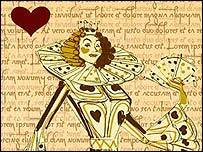 Mr Beddor got the idea after meeting an antiquities dealer in London who specialised in packs of cards - the dealer believed Wonderland was a real place. "He had a birth certificate to prove Alice was adopted and a letter from her publisher saying the original tale was fictionalised and that Carroll had betrayed her," says Mr Beddor. There appears to be a blur between fantasy and reality in this interesting premise, and of the dealer himself, Mr Beddor will only say: "We all have our own reality." The Looking Glass Wars takes several original Alice characters, including the Cheshire Cat and the Mad Hatter, and turns them into weapon-wielding superheroes or villains. It also draws on Carroll's follow-up, Through the Looking Glass and What Alice Found There. Mr Beddor makes no apology for drawing on the many modern influences in his book, including films Star Wars and The Matrix. "I conceived the story first as a movie and then as a possible book. I wrote it in secrecy, I was so nervous. It took a very long time to figure it out." He did not enjoy Alice's Adventures in Wonderland as a child, finding it to be "a terrible girls' book", although he now thinks they are "brilliant". "It's very episodic, it didn't have the momentum and wasn't a page-turner. But I loved the strong female so I've kept her in the quest story, and she's surrounded by creatures boys can relate to, too." The book is violent in parts and Mr Beddor says he had to trim some parts of it, including sections where limbs are hacked off: "I didn't want to distract from that world. "But kids are used to a more violent and real world now - video games and movies are dominating, and hopefully they will love this book." Not everybody loves it though. Will Booker, associate professor of communications at Richmond University, was distinctly unimpressed. "It's one of the worst books I've ever read, although the basic concept was promising. "I'm not a purist - Alice has survived through many adaptations and changes in the past," he says. "But the style of writing is clumsy... like Saturday morning cartoons, and the dialogue is leaden." Alan White, Secretary of the Lewis Carroll Society, agrees, although he makes clear this is his personal opinion, not the that of the organisation. "I have no problem with someone re-writing the story, that's not new. But it's poorly written and I found it a chore to read. Mr Beddor has not understood Lewis Carroll." But children's book reviewer, John McLay, is a big fan. "It's very imaginative - the Alice books were his inspiration but he has still created an original book, he has added to the Alice legend. "Young readers will appreciate it - it's quite violent but in context." He believes it will do well when it is published next month. "Frank Beddor has set the story up wonderfully, it's a very clever book." The author himself is unsure of the reaction he will receive when other academics get round to reading it: "Oxford University (where Carroll was a tutor and lecturer) has to keep Carroll sacred." But whatever the outcome, he is optimistic about completing his trilogy, and a film deal is also a possibility. "There will be more pressure for the next two books but Alyss's world has been created so it should be easier." 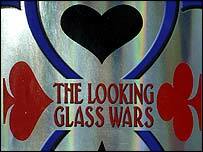 The Looking Glass Wars (Egmont Books) is published in the UK on 6 September.